It’s unused, so there’s no postmark on the back that I can use to nail down the date, but we can glean a few clues from the photo itself. First, quite obviously it’s a WWII-era photo. Probably early WWII because the rifles at stack arms are the M1903 Springfield. Since Camp Roberts opened in March, 1941 and the US Army had effectively replaced the venerable ’03 Springfield with the new M1 Garand by early 1942 I’ll date this photo to mid-to-late 1941. Next, I don’t think these Soldiers are ‘surveying’. 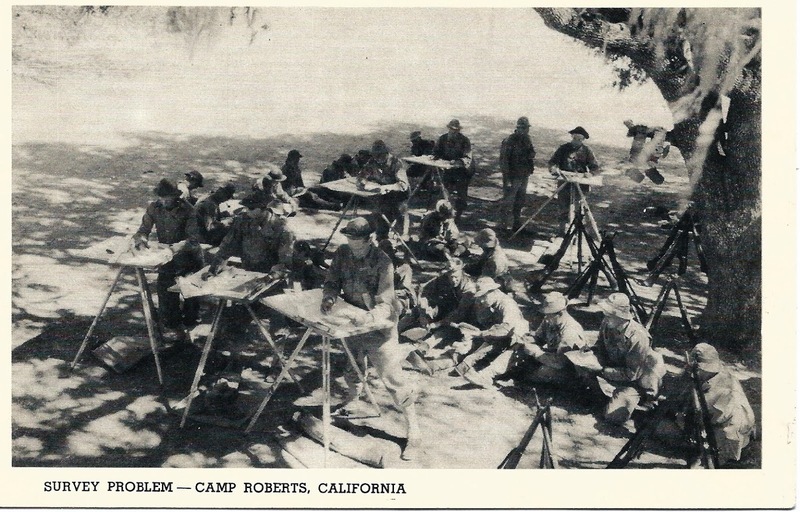 Since Camp Roberts was primarily an Infantry and Artillery training center my guess is that these are soldiers taking a class in Field Artillery plotting using plane tables. Plane tables were a common item in Field Artillery battery TOEs, intended to be used as a field expedient plotting table. I have one in my collection with the case stenciled ‘HQ FDC’ – Headquarters Fire Direction Center. I have no idea which headquarters or which fire direction center, but clearly it was a piece of Field Artillery equipment (and identical to the plane tables used by Engineer survey units). Another clue that this is a Field Artillery class is the use of large artillery plotting protractors. You can just make them out on the plane tables in the foreground – large semi-circular protractors with a rotating plotting ruler mounted at the center. Plus, there are no alidades visible, a key piece of equipment for any survey plane table work. Yup, these are Field Artillery soldiers learning how to plot artillery fire. But I will forgive the publisher’s gaffe because it’s still a neat picture of Army training in early WWII. The stacked rifles, the ammunition belts with canteens hanging from the tree, the Soldiers working the problems at the plotting boards while their classmates sit behind them studying their manuals. I love how the plane tables are arrayed in an arc to best utilize the shade from the tree. Looking at aerial photos of Camp Roberts on Google I’m guessing these guys found one of the very few shade trees available in this part of California. This entry was posted in History and tagged survey by Brian Haren. Bookmark the permalink.